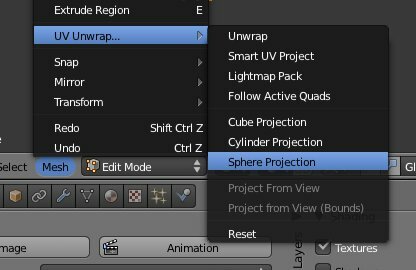 It might be easier if instead of unwraping using the 'smart projections' you use the sphere option. It will create a much more understandable map that will be easier to texture (it is how I texture asteroids). This method is suited to spherical ships and asteroids. the vertexes highlighted show which ones that I moved, you will notice that the map looks much tidier. You can now either texture-paint onto your model or export the image and texture it with Gimp or Photoshop. Remeber that this method only works with spherical (or slightly spherical) models. Nice one Staer9 - I explained it badly - you showed it really well! Picture being worth a thousand words and all that. 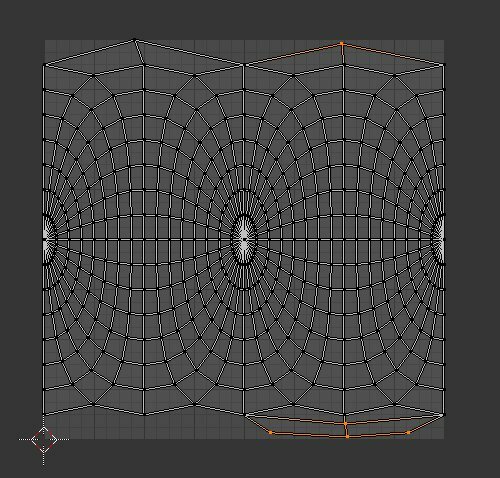 Wings3D does something similar - it does a "smart" projection of top, bottom, front, back, left right - which works for "normal shapes" - but fails for spherical shapes in much the same way as blender does. Wings3D will unwrap a sphere providing you tell it where you'd like to split it initially, using a spherical projection. It's not bad, but not great either! Sorry, I guess I jumped the gun. I was just trying to recreate a Kzin Ship as described in the Larry Niven story "The Warriors". Didn't realize it would cause problems. I'll definitely try what you suggested, and I think I will start from scratch. Thanks for the advice. That is not what I meant at all! There is no problem in being ambitious, I was not upset that you had made a spherical ship, I was impressed . Please try as hard as you can to cause problems, it means I have to write another tutorial that will explain how to deal with it so you and everyone else that had (or will have) that problem can deal with it. That's great, because causing problems is what I do best. First of all, thanks for the great tutorial, Staer9! It worked very well for me, to create my first ship, the Trident Privateer. Now I'm working on a space station, the Trident Shipyards an I have a problem making it in Blender 2.59. You can see it in the picture below. I have imported the original Oolite Coriolis station to show my problem. If the model gets larger, I can see it only partly. Blender does never show whole station. If I spin or move the object, large parts of it disappear (here the lower left part of the station). Is there any option I need to activate, to see the wole model? If the model gets larger, I can see it only partly. I think Staer9 can answer the limitations better than I can do, but in my first attempt at designing Avernus Orbital I had the same impression and started to use Wings3D and Blender at the time. They have their own advantages and I found Blender has more control with small Models. But doing Insets(Called Insects by Smivs ) are much easier to do with Wing3D, but Blender gives more control over assembling parts but very poor on scaling. So got the model finished in Blender and Resized it Wings3D. But when I forget to resize! Yes, that problem is a common one, the best thing to do is scale it down in object mode (NOT edit mode) this reduces the size it appears in blender, but not its actual size, scaling in edit mode reduces actual size. If this makes any sense, then great! I'll also start work on a "making dockables" tutorial which will go into it at quite some detail. Hello, I'm back again.......and stuck. SURPRISE!!! Yeah, I got into a rut that I just can't steer out of (very poor English). I tried all the steps you suggested for making this work for a sphere, and it was going great. I got so far as to have at least a beginning of painting and shading. This is where I have become stuck. I saved my work (I thought), but it seems that I only saved in .png form the unwrapped version of my ship, and I haven't got a clue how to wrap it back up. Did I blow it? I don't seem to have a blender image of the ship, which I REALLY wanted to keep, as it was what made the thing look more like a ship. A blobby ship, but a ship just the same. Is there a way to rescue this? 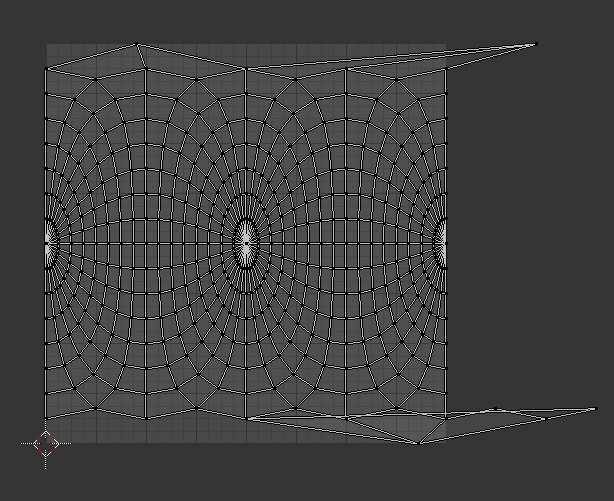 Also, I have a question about another matter that could involve Blender, but I'm not certain how. I used Gimp Image Editor to transform a Horton Ho-229 flying wing, into something more resembling a spacecraft, with planet entry capability. It's looking pretty good on Gimp. I have angles of it from top, bottom, and am working on a side view. Is there a way to make this compatible with Oolite? There is, but it can take some time. you should however realise that the second tutorial uses an old version of blender and therefore one shortcut is different, for adding objects in the latest release you click "add" at the top bar, dont use the spacebar. Thanks again. That is really great material. Easy to follow. This should be an interesting project. Thanks Staer9. Sorry to come right back again like this, but I've hit a snag. One of the steps in the Blueprint tutorial was to click on view, and then select Background, except the version of Blender I have doesn't have that option in the View menu. The tutorial didn't give me any alternatives, either. Is that a really important step, or could I just go on without it?